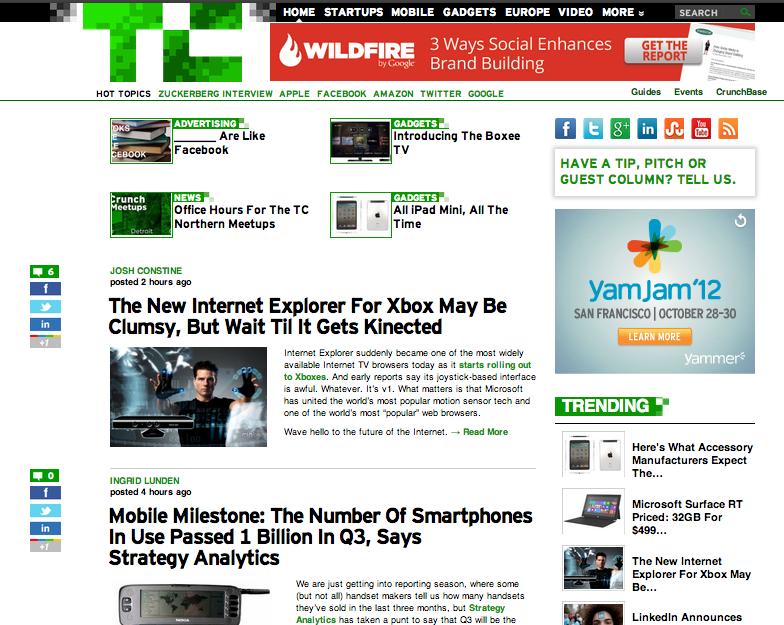 TechCrunch is a technology-related media property that has become the most visited source (by number of monthly unique visitors) for tech news, commentary, and opinion. Created by Michael Arrington in June 2005, it started as a news source but has expanded to offer other services such as Crunchbase, the defacto database of technology company information. The design is clean and simple, with a scrolling homepage designed to allow discovery of breaking tech news. Highlighting events on the homepage helps facilitate offline tech-related meetups that they endorse – thereby branding TC as a destination to discover tech/networking events. The right navigation highlights “trending” events to show users what is most popular on the site. The left of every article synopsis highlights social plugins as well. According to the Techcrunch press kit, its audience skews slightly more towards males in the 24-45 age range, but the site is used by anyone interested in breaking technology news. TechCrunch claims to have over 17 million monthly unique visitors and 2 million Facebook fans, so it’s obvious that the site has value not only to technology professionals, but tech enthusiasts of all kinds. Drive traffic and monetize that traffic through ads (sponsored display ads primarily). There are tons of highlighted social sharing buttons on the homepage (top right navigation), and on every article.